There are plenty of events that those with Microsoft Dynamics jobs should be paying attention to, and if you’re in the UK, one of the big ones is just around the corner: Future Decoded. So, what is this event? What will you learn if you’re a technology or business leader? Will it help you with your search for your next contract or permanent Microsoft Dynamics role? We’ll be down at the event covering all the important news for you. Here’s a taster of what’s to come. Following on from the massive success of Future Decoded 2014, this year’s event will see 10,000 of the brightest IT and business decision makers, developers and partners from across the UK and Europe descend on London’s ExCel Centre in November for two days of Microsoft-focussed future-gazing. Tuesday 10th November 2015 is aimed at the Enterprise, Partner and SMB audiences, while Wednesday 11th is aimed primarily at technology leaders and IT experts. With influential speakers like Microsoft CEO Satya Nadella, Craig Kreeger, CE of Virgin Atlantic, Richard Reed, Co-Founder at Innocent, plus many more, you’ll hear first-hand how some of the very best business and technical innovators have transformed their companies using Microsoft-powered technology. 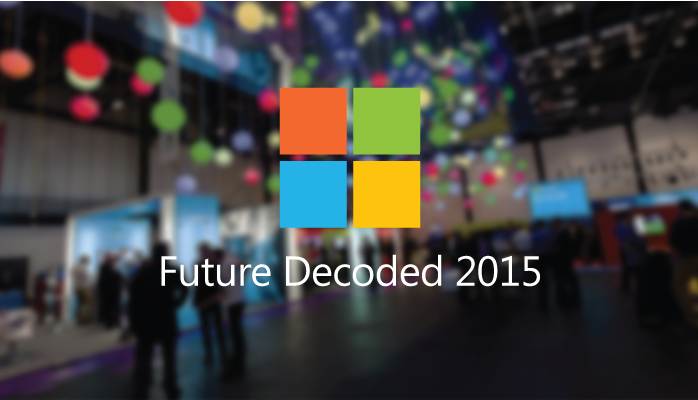 It’s true that Future Decoded is a broad technology symposium aimed at the wider IT market, so what impact will it have – if any – on Microsoft Dynamics professionals? First, there’s something to be said for taking a wider interest in the conversations around the approach that Microsoft is taking as an industry leader. Their cloud-first, mobile-first philosophy has led them to transforming into a services-led industry that would have been unrecognisable a decade ago – time to get updated! For those looking for Microsoft Dynamics jobs, both days at the event contain lengthy networking sessions to guarantee that you can meet new collaborators, clients, and others, as well as renew old friendships and working relationships. In other words, it’s a great opportunity to put yourself out there and demonstrate your value as a future employee who’s engaged in the broader technology arena. If you’re unable to make it to the event in person, don’t worry! We’ll be there to cover the event fully, keeping you up to date by live tweeting the keynotes and writing up any of the big stories that emerge over the two days. This means that even if you’re not at the event, you can still be fully engaged with what’s happening, and have your say with the wider Microsoft Dynamics and IT community. At Conspicuous, our Microsoft Dynamics Consultants have years of experience helping IT professionals into Dynamics jobs here in the UK and US. For the latest Dynamics roles, visit our site, or give us a call on +44(0)1483 233 000.